On this Python based platform we build our experimental stimuli. Developed by vision scientists, it provides the user with a friendly interface and a rich GUI. It allows even beginners to build a quite complex experiment in a intuitive way. By adding custom code you will be able to use all the powers of Python. Palamedes is a Matlab toolbox for psychophysics. It provides you with various function fits and model comparisons specifically designed for psychophysical experiments. ​Arduino is the combination of a simple and compatible hardware, a rich software environment and a huge users’ community, all open source. Arduino boards are microcontrollers running 5 volt input/output channels, both digital and analog, that communicate with your computer through a USB port. You can pin to Arduino any type of sensor as input and motor, led, relay module, or digital information as output. We use it to activate vibromotors for our somatosensory experiments, and we verified that they don’t interfere in EEG recordings. We do our data analyses on Matlab. The variety of packages and the accessible language make Matlab a precious tool for thousands of scientists around the world. ​Opensesame is a versatile python based platform for psychological experiments, offering a variety of stimulations and response collections, built-in plugins to interface with eye trackers, serial and parallel ports, EEG systems and other. Fully open source and with the option to integrate inline python code, it is developed by a strong community so that you can be sure that the code/plugin/answer you are looking for is already out there in the forum. Yet, you cannot ask Opensesame perfect control over visual stimuli, as you can, for example, in Psychopy, but on the other hand it allows for conditional ramifications of the experiments (“if subject presses this key, then run this routine, otherwise…”), which are not readily accessible in Psychopy. ​On FieldTrip we run our physiological analyses. It is best friend of any scientist working with EEG and MEG. 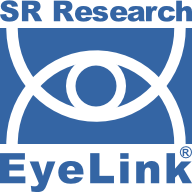 EyeLink technology allows us to track eye movements through infrared rays which capture location and size of the pupil and automatically translates it coordinates on the screen. In addition to the camera, EyeLink comes together with a tailored experiment builder which includes a set of functions to recognize automatically and in real time saccades from fixations in specific areas of interest on the screen. This is very useful to log only relevant information from the huge amount of raw data that the camera collects at every frame (in our model, 2000 Hz). Finally, a data viewer software allows us to analyze logged data according to predefined functions. EyeLink provides excellent costumers service which includes tutorials, sample experiments, and assistance in designing and debugging.